The Rosey Christmas Tree combines long lasting corokia stems for the tree structure, bright roses to add depth and dimension and topped with a beautiful Christmas Star. 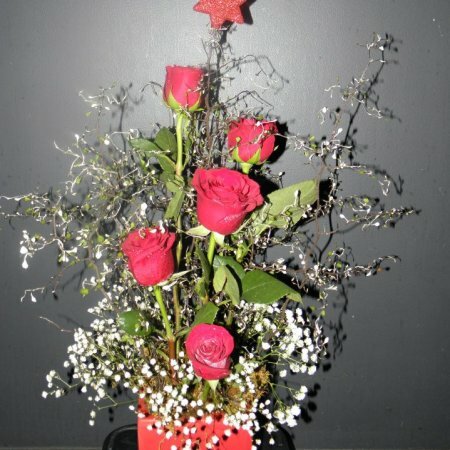 This arrangement is a unique take on a Christmas Tree, and is the perfect gift this holiday season. Say Thank You, I Love You, Merry Christmas, or Just Because with the help pf Amaranthine Flowers By Design, Charlestown Square, Newcastle. Same day delivery, seven days a week, available to all areas of Newcastle, Lake Macquarie and Maitland. Including John Hunter Hospital, Newcastle Private Hospital, Lake Macquarie Private Hospital, Maitland Hospital and Mater Hospital.